A blank canvas is perfect. Pure, flawless, white. An artist can look at it forever, brush in hand, knowing that from the moment the paint touches the canvas, the perfection is ruined forever. Your future is the canvas. Your unique combination of skills, experience and passion is your brush and pallet. You can stand there looking at the future, too scared to make a mistake and waste the canvas in front of you. Or you can take a deep breath, pick up your brush and start creating something wonderful. Ideas always seem perfect in our heads. What could possibly go wrong when your dreams remain dreams? But that’s not what they’re meant for. You are meant to try. To be average, then good, then terrific, then masterful. With a lot of false strokes along the way. Success in life isn’t about not doing the wrong thing, it’s about doing the right thing. You will make mistakes, you will have to say sorry, you will have constant opportunities to keep learning. So stop looking at the perfect blank canvas, and start making art. 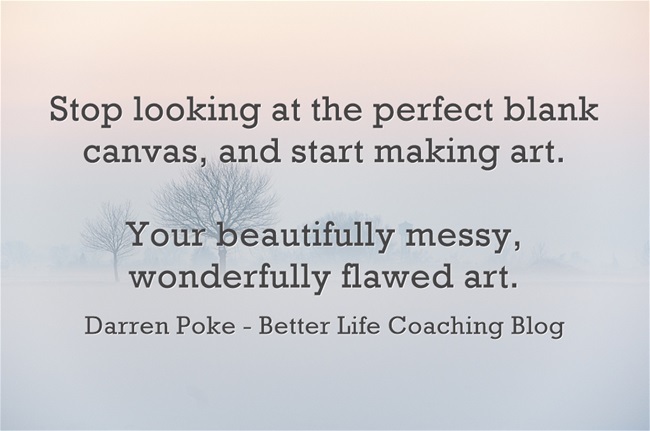 Your beautifully messy, wonderfully flawed art.